Click here to visit the new post. 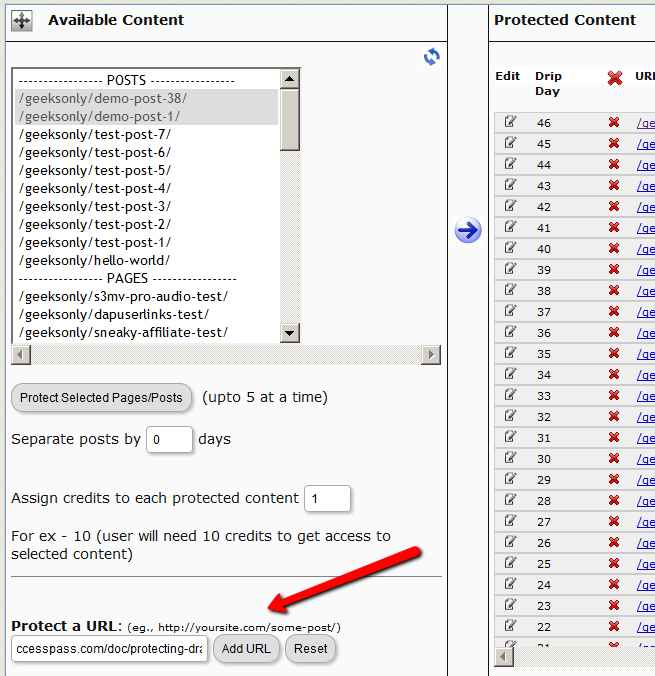 DAP has a feature called “DAP Shortcodes” that allows you to do partial or in-page content protection. 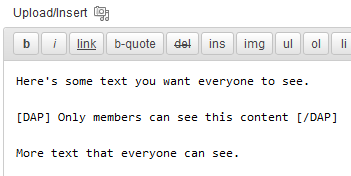 (RELATED: If you are looking for merge tags to place into WordPress posts, then see Merge Tags for WordPress. For email-related merge tags, see Merge Tags for Email). So if you had a blog post or page with 3 paragraphs of text and a video, you can protect just the video from certain groups of viewers, and leave the text portions open for anyone to read. a) Replace the text that is enclosed by the short codes with an error message. You can fully customize the style and text of the error message. By adding an additional parameter to the shortcode, you can make the error message completely disappear. 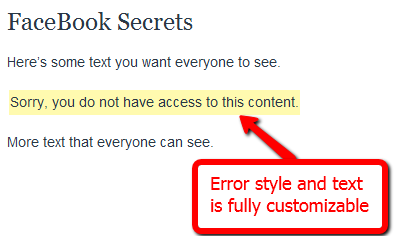 No error message at all – like that section of content never even existed, and no errors or warnings shown either. The DAP Shortcodes may be used to quickly protect content that you don’t necessarily wish to create a DAP Product for. So if you don’t care about dripping some content, but just wish to protect it from say, non-members, or make it available only to certain “levels”, then you can do it by using the DAP Shortcode, and not have to worry about adding it to any particular level first. These Shortcodes may or may not be used within content that is already protected as part of a DAP Product. Totally up to you. This section just lists all of the available shortcodes so you can quickly see everything in one glance. Details about each shortcode is available in the next section below. If you don’t include endday in your shortcode, then the default value for endday is taken as 9999 – which means forever access. NEWESTFIRST will drip newly dripped links at the top. So day 7 link will be above day 1 link. OLDESTFIRST will drip newly dripped links towards the bottom. So day 1 link will be above day 7 link. showproductcount=”N” will disable the heading “You have access to X products” at the top of the “My Content” section. More examples and details in the “Shortcode Details” section below. All of the shortcodes listed in the above “Shortcode Summary” section, are explained here. This is the shortest version of the DAP Shortcode. 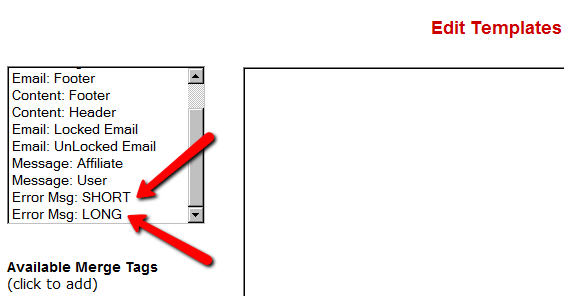 In this version, anything you put between the [DAP] and [/DAP] tags, will be viewable only by a logged-in user. No other restrictions for the content to be viewed, except that the viewer has to be logged in to your membership site (via DAP). So basically all free and paid members, regardless of which product they have access to, regardless of whether their product access is active or expired, can view the private content. This is the full version of the DAP Shortcode. All inner tags – hasAccessTo and errMsgTemplate – are all OPTIONAL. hasAccessTo: Comma-separated list of one or more Product Id’s that you want the user to have access to before they can view the content. So if you enter 3 different product id’s (like hasAccessTo=”2,7,14″) it means “Anyone with access to AT LEAST ONE of those products with the product Id’s 2, 17 or 14. It does NOT mean they have to have access to all of them at once. Access to any one is fine. errMsgTemplate: This determines the HTML/text of the error message displayed, if user DOES NOT have access to the content being protected. Values may be Can be SHORT, LONG or “” (empty). NOT mandatory. If omitted entirely from the tag, then the default template used is SHORT. The HTML/text displayed by the SHORT and LONG templates can be configured via the Setup > Templates screen, as shown below. Viewable by ANY logged in user (FREE or PAID – doesn’t matter) who is a user of the product with the ID “1” (you can get the Product id from the “Products > Manage” screen). Display HTML/text from the SHORT template if user does not have access to the private content. Viewable by ANY logged in user (FREE or PAID – doesn’t matter) who has access to EITHER of the Products – 1, 2 or 3. Display HTML/text from the LONG template if user does not have access to the private content. Let’s say you run a coaching program. You have 10 clients. You want Joe Customer to see a tailor-made custom video meant only for Joe, and Jill Member to see a specific PDF report written specifically for Jill’s business. Now using the new “userId” parameter in the DAP shortcode, you can now protect a piece of content so that only a specific DAP user can see it. DAP Shortcodes now include the ability to specify a “Day” right within the shortcode itself. So you can now publish, say, 10 videos on one page, and you can enclose each video’s embed code with a separate DAP Shortcode that has a different “Day” setting, so the very same page will show 1 video on Day 1, 2 videos on Day 2, 3 videos on Day 3, and so on. NOTE: Please remember that you may not omit the hasAccessTo field – you must use the hasAccessTo field to specify a product id, because all start “days” for a user are associated with a product. Starting DAP v4.1, you can now mark content such that it will NOT be displayed to members who ARE logged in. To put it another way, it will HIDE content from members, and show it ONLY to NON-Members. For example, this could be your sales copy or your buy-button, that you don’t want your logged in members (who may have already purchased the product) to see. Here’s the shortcode for that. You can set a date UNTIL which a blog post is public (no protection or rules will be applied from any other shortcode parameters. You can set a date AFTER which a blog post will become public (no protection or rules will be applied from any other shortcode parameters. Now you can specify “startday” and “endday” in the shortcodes to make the contents stop being shown after a certain end “day”. Previously available “day” variable has been deprecated and replaced by “startday” instead. However, if you already are using it somewhere, it will continue to work as is. However, if you wish to use the “endday” variable, you must now also use “startday” instead of “day”. Very useful for, say, displaying a message on the Welcome page only on the first day. You can also specify actual dripping “dates” (instead of “days”) by using “startdate” and “enddate” in the shortcodes to make the contents stop being shown after a certain end “date”. “startday” and “endday” can also be a negative number. This basically means, the message “Howdy” will be shown starting 6 days before the “Access End Date” of the user’s access to the product with Id “2” (specified in hasAccessTo). So you can use this to display a special message – or specially priced offer (buy button) – for those whose access has not yet expired. Last day (same day of access end date) is day 0. Day before that is -1. Allows you to display links that are coming soon. Allows you to selectively display profile fields on a page. Just set the profile field that you don’t want shown to “N” in the tag below. Default is “Y”. So Leaving out the text showLastName=”Y” entirely from the shortcode, is the same as setting it “Y”, which means it will be displayed. So just entering the text [DAPUserProfile] into a page, will show ALL fields. So all other fields will be displayed, except those two. This shortcode shows a user their referring Affiliate’s (a.k.a Sponsor’s) information. So when a user visits the page that has this shortcode, it will display information of that user’s referring Affiliate – either from cookie (if exists), or if they’re already a member, then their current Affiliate’s information. And if neither the cookie is set, nor the user has an Affiliate attached to their account already, then it will show the info of the DAP Admin). So you can use it to show the user information of the person (affiliate) who referred them to the page. Think of it as a “Your Sponsor” tag. DAP has a feature called “Sneak-Peek” where you can show a part of your blog post or page to casual visitors (as well as to search engines like Google) and then when they click on the “Read more…” link, the protection will kick in for the rest of the post, and DAP will say something to the effect of “Sorry, you must be logged in to access this content. Please login below or click here to get access”. And that error page will contain both the login form, as well as a link to your sales page. Of course, you can customize this error page to say whatever you want, but that’s another topic altogether. Sneak-Peek allows you to show “teaser” content to potential members, instead of fully locking it up and showing just an error page. Using Sneak-Peek allows you to show some content to casual visitors in order to get them to subscribe to see the rest of the content, as well as keep some content open so that search engines like Google will have some content to index in their search databases, so that the open part of the content can show up in search results for potentially matching keywords, and bring you some free organic search traffic to your site. Fig A: “More” icon in WP. Click to enlarge. You can also insert the more tag in to your post or page, by clicking on the icon shown in the image above – that looks like two rectangles separated by a dotted line – on the WordPress page/post edit screen. Of course, exactly what that “Read more” link will say (it could say, for eg., “Click here to read the rest of this post”) is determined by your actual WP theme. Regardless of what it says, when you have a protected post, by default (when sneak peek is off) that post will completely disappear from your blog for non-members and those who are logged in, but don’t have access to it yet. And even to Google. But if you insert the “More” tag in to all of your pages and posts, then on your blog’s summary page (which lists all of your posts), all posts with the more tag (protected and un-protected will show up to the more tag, and when someone clicks on the “Read more’ link, that’s when DAP’s security kicks in and if the user has access to that content, it will show her the rest of the post. But if the user is either not logged in, or is logged in and does not have access to that content (either access is yet to come because of the drip, or content has already expired), then it will show the appropriate error message. To protect your content, if you turn on “Sneak-Peek” in DAP, and you inadvertently (or intentionally) don’t insert the “more” tag into a post, then the entire post will get hidden and protected by default, and nothing will be shown except the error message. So you want your blog’s home page to be a “static” page – could be your “Sales page”. And then you want your actual blog content (where all of your posts show in reverse order), on a different page – like “Members” or “Lessons” or “Blog”. 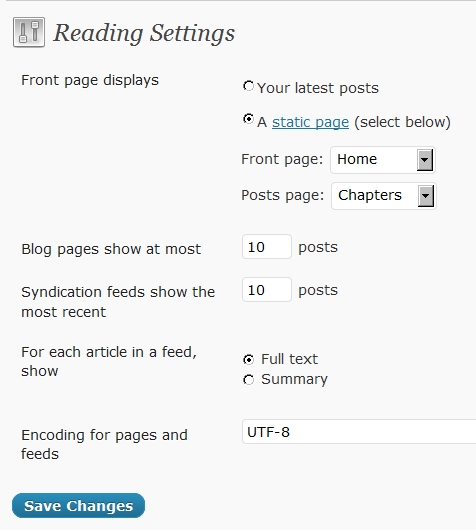 Create a WordPress “page” that will become your blog’s new “static” home page. Let’s give it the title, “Home”. 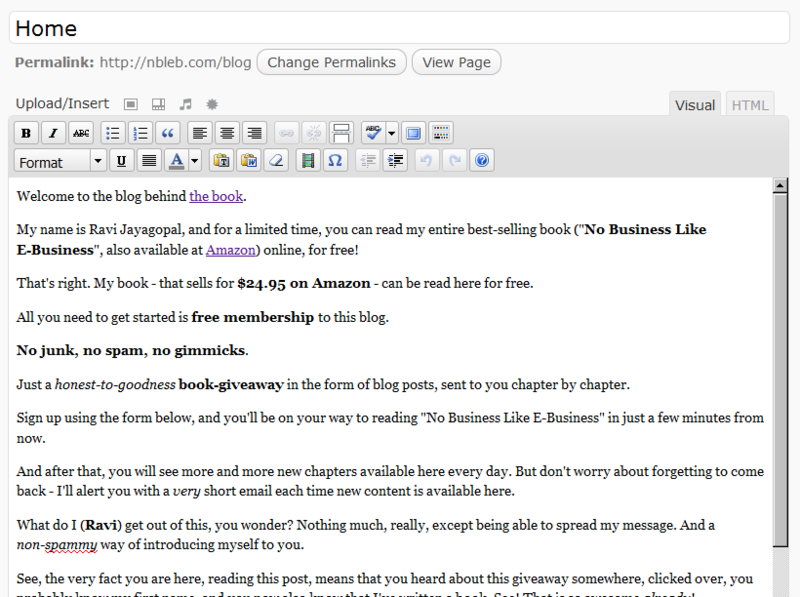 Publish your content within this WP page, and it could even have a sign-up form, or your “Buy” button(s). Publish it. Next, you create a new page which will not have any content, but will serve as a “placeholder” for all of your blog posts to be displayed in reverse chronological order, just like it would show up on any regular blog. In the example below, the page title is “Chapters”. You could call it “Lessons”, “Blog”, “Blog Posts”, “Member Blog”, etc. a) Change “Front page displays” to “A static page“, as shown below. For “Front Page“, pick the page you created in Step 1 above (your static “Home” page). 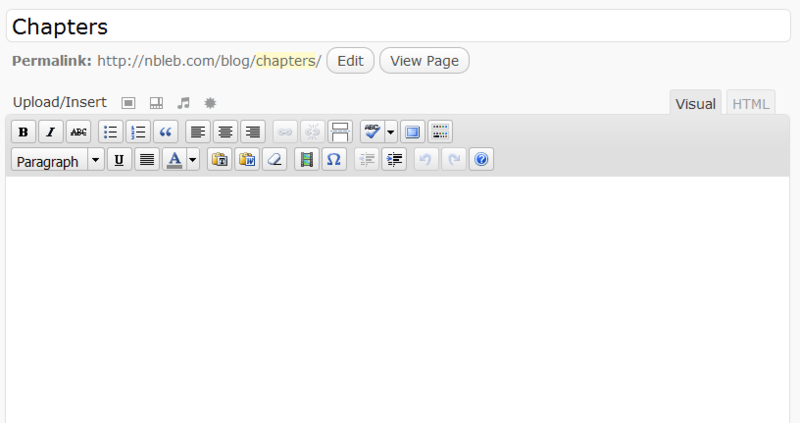 For “Posts Page“, pick the page you created in Step 2 above (your “Chapters” page). Oh, and none of this has anything to do with DAP, by the way. This is all WordPress. This is better suited for a WP “page”. This text will be replaced by a login form using which your members can log in to your membership site. This will be replaced by the entire Affiliate section from the default home page at YourSite.com/dap/ . Better suited for a Page. This will be replaced by the user profile from the default home page at YourSite.com/dap/. Better suited for a Page. This will be replaced by the user links section (the list of what products and what links user currently has access to) from the default home page at YourSite.com/dap/. Better suited for a Page. This will be replaced by the first-name of the user. This will be replaced by the email id of the user. This will display the DAP user’s “Username” on the page. This will display the DAP user’s ID on the page (ID is a number). Replaces with user’s personalized RSS feed URL. Replaces merge tag with Product-specific details (including links available to the member as part of that Product) on a specific WordPress page/post. Displays data of the user’s “upline” affiliate. Displays upcoming drip-feed scheduled content. Displays id of affiliate who referred visitor to site. If no affiliate set, displays DAP Admin’s id. Shows list of all transactions/orders by logged-in user. Shows list of all subscriptions by logged-in user.